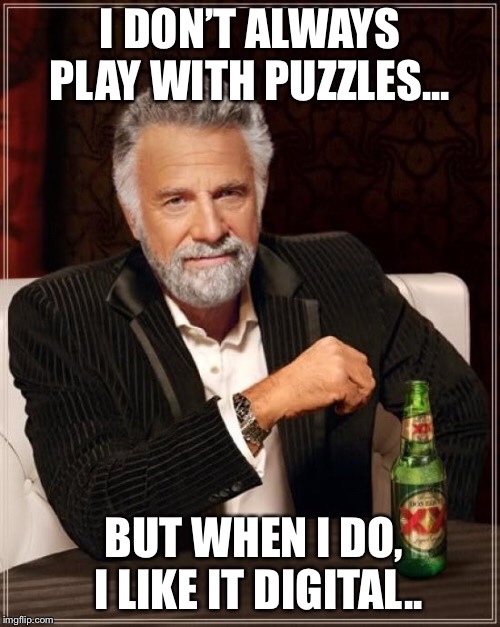 I don’t always play with puzzles, BUT when I do…. I like it Digital. There are a few things I am incapable of doing digitally YET. Dot 2 Dot is one of them. There are a ‘few’ free dot to dots around, I’ve done them.. There are virtually no downloadable PDF files of dot to dots! Kindle needs to fix this asap! (Note to self : tell them!) The dot to dots are so relaxing that I MUST HAVE THEM. Sooooo… I was forced to come up with a solution on my own. Enter a simple scanner app called CamScanner + | PDF Scanner. There are various scanner apps and you may find one you like better than this one… but let me tell you why I love this one. CamScanner has a simple interface, no confusing bells and whistles, and yet it has all the capabilities you could ask for. I can tag my images and/or put them in folders to allow for better searching and organizing. I can set a pdf password for those moments when I need to scan more personal paperwork. Most importantly, when scanning, it allows me to define the edges before scanning. When the scanning is all complete, I share the document straight to my ipad using AirDrop, straight to GoodNotes 4, and straight to my dot to dot journal that is all open and ready before I start scanning. See below for step by step instructions without all the rambling. BEFORE I forget, get interrupted by a hungry child? Lost husband? Laundry buzzer? Work (meh!)? That’s okay, you can come back to your scanning at any time and continue to add to the pdf file you are building. You can break them up as small or as large a file as you want. I am a fan of small files, but you don’t have to use small ones. So.. onto the simplified instructions. 1. Open GoodNotes 4 on the iPad and then to the journal where you will be storing your dot to dot books. 2. On your phone (or iPad if you like using that camera), open CamScanner+, select your camera button. 3. There are multiple choices for scan types, I use Single. 4. Center the page in the viewfinder that you wish to scan and touch your camera button. 5. Adjust the edges of your page to where ever you like and touch the finished check mark. It doesn’t really matter if it’s messy or straight or anything. 6. It automatically gives you color options, choose which you like best. I use B&W on every single one and touch your continue check mark again. 7. That’s it! You’ve scanned your first page. Simply touch the camera button at the bottom to add a new page to the document and repeat the above steps. Easy Peasy! 8. Once it is all filled (I use 8 pages, you can use as many as you like), touch the share button, select pdf, and send to the iPad using AirDrop. 1. The pdf will pop open a list of apps for you to choose from. Select GoodNotes and it will open up into the app. You will be prompted to select where in the journal you want it placed. I always import below the current page. When doing these pages, I am not interested in perfection at all. Sometimes the title gets cut off, sometimes there’s pixels that don’t belong, it’s all okay.. My only purpose is for me to get those dot to dots digital so that I don’t have to carry any books around with me. « Monday Mantra : Iam strong. I can do this. I’ve got this. I am worth it. I am a success.